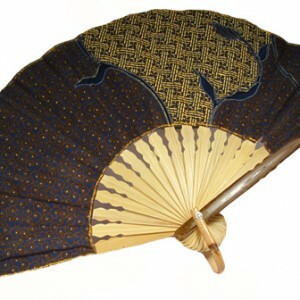 Folding Hand Fans have been an important accessory of every woman since very old times. The variety of materials, designs and colours of the folding hand fans can satisfy every woman’s taste: they could be made from bamboo or timber, silk, cotton or paper, the colors could be bright or dark, they could be hand-painted or have only one colour. A folding hand fan could be a wonderful little present for every woman or girl as an excellent way to keep cool in when it’s hot or as an exclusive and special house decoration. The origin of this popular and unique artifact is rather uncertain. It could be presumed that its origins can be traced to ancient times, when people found out about fire and tried to use any kind of object to blow air and keep the fire alive. Because of creative and artistic portrayals of this object, we now understand that fans were widely used by Egyptians, Babylonians, Persians, Greeks and Romans. The earliest known depiction of it in Egypt is in a ritualistic hammer that can be seen at the Ashmolean Museum of Oxford. It belonged to pharaoh Narmer, that lived around 3000 B.C. and for the very first time unified low and high Egypt. This depiction shows several royal servants, two of them are carrying the handheld fans. As time went by, folding hand fans came to be a decorative objects with an unique and distinctive meaning. Your Cratfs Fair offers you a collection of handcrafted colourful Folding Hand Fans from Indonesia.